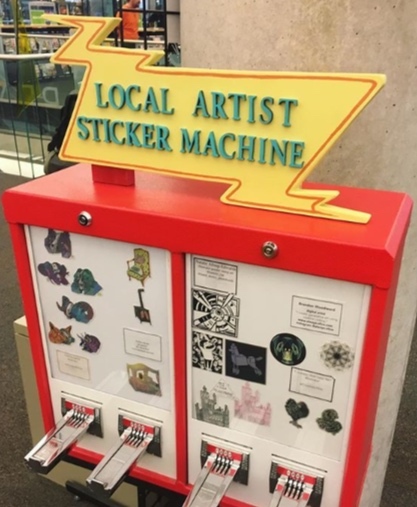 The Local Artist Sticker machine is a Sticker Vending Machine project to promote local art. There are 21 machines across Salt Lake, Ogden, and one satellite in Austin Texas. Each machine sells limited-edition art stickers designed by local artists. These curated displays change monthly like a tiny gallery. The idea is to elevate local artists and make art approachable to buy and collect! Anyone can submit their art! Selected artists are plaid royalties, their designs are turned into stickers and sold in machines alongside information about the designer! Artists and the spaces that host machines are featured on my website and instagram. See the map and list of locations to find one near you!